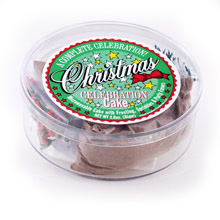 Send a Christmas cake instead of a Christmas card or add to a festive holiday gift basket. A great stocking stuffer for kids and adults! Available in either Chocolate or White.